The Sanken Chromatic series of nine professional studio microphones provide musicians, sound designers, engineers and producers with the ultimate set of pure, transparent sounding mics for a wide variety of applications. They are designed and meticulously engineered in Japan using the latest technology and include many innovative features such as membranes impervious to humidity and temperature change. The result is a set of mics that have phenomenal frequency response, accurate off axis response, exact patterns, minimal proximity effect, low noise and high SPL tolerance. Quite simply they are the most natural sounding mics available today that translate the sound you hear and love in the studio to the actual recording. Capture that great voice, that amazing sounding piano, or that powerful acoustic guitar. There are many tools and choices to color the sound during the mix. Sanken Chromatic mics capture what the musician is actually playing or singing with vivid reality. Sanken Chromatic is a division of plus24 based in Los Angeles, the exclusive distributor of Sanken Microphones and Accessories in the USA and Canada. Started in 1986 as Developing Technologies Distributors, the company was renamed in 2002 as plus24 to signify the full commitment to the highest possible standards. Today plus24 reaches out to markets worldwide and continues to work closely with manufacturers to design, develop and introduce truly unique and valuable tools for the wide world of entertainment production. Please use this form for sales, press and general information requests, USA only. For support please go to the Support page. 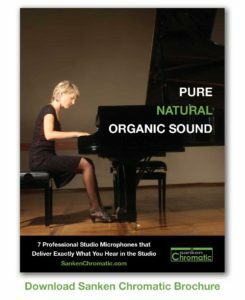 Note: We only manage Sanken Chromatic Mic sales and support in North America. For other countries please visit the Sanken Japanese site. Note: We only manage Sanken Chromatic Sales in North America. For other countries see the Sanken Japanese website.